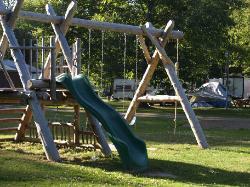 We offer several products and services to make your camping adventure more enjoyable. We sell ice for $2.00 per bag at the office. No need to run into town when you need to restock the cooler! Our firewood is affordable, eliminating the need to purchase it in town or transport it. We deliver directly to your site. Need internet? Free connections available at the front office or back pavillion. Our new bath house is equipped with sinks, toilets and coin operated hot showers (including accessible facilities). Will your visit include fishing? If so, take advantage of our stainless steel fish cleaning station, equipped with running water and lights. Pump out station with a water hose is located at the park entrance for your convenience ($5.00 charge, unless paying for sewer site). Arts & crafts activities are scheduled through the months of June,July, and August. Specific dates and times are posted at the office every Friday.